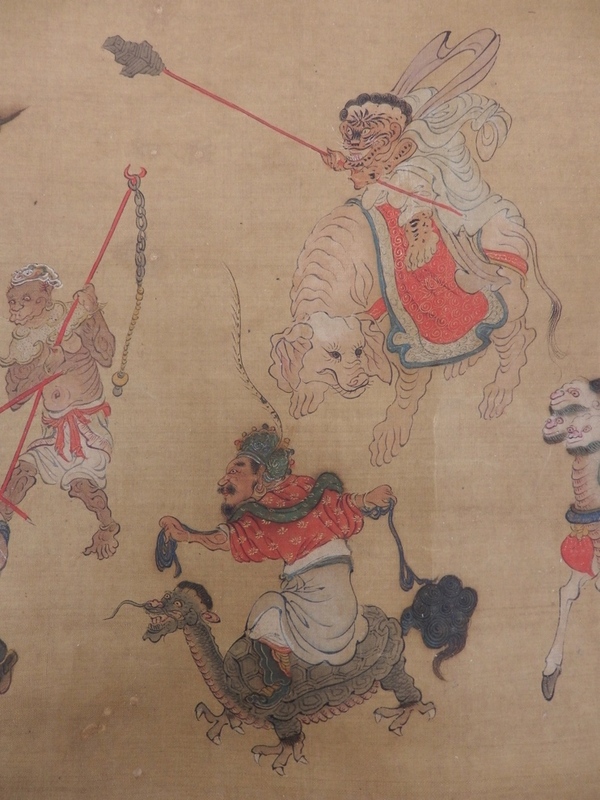 A curious item in Maidstone Museum’s collection is a Chinese painting nicknamed ‘The Hell Scroll’, which features an assortment of demonic creatures armed with halberds and spears. These monsters form a bizarre army, waving flags and riding on the backs of strange beasts, while calmly stood in their midst are groups of beautiful young women with children. 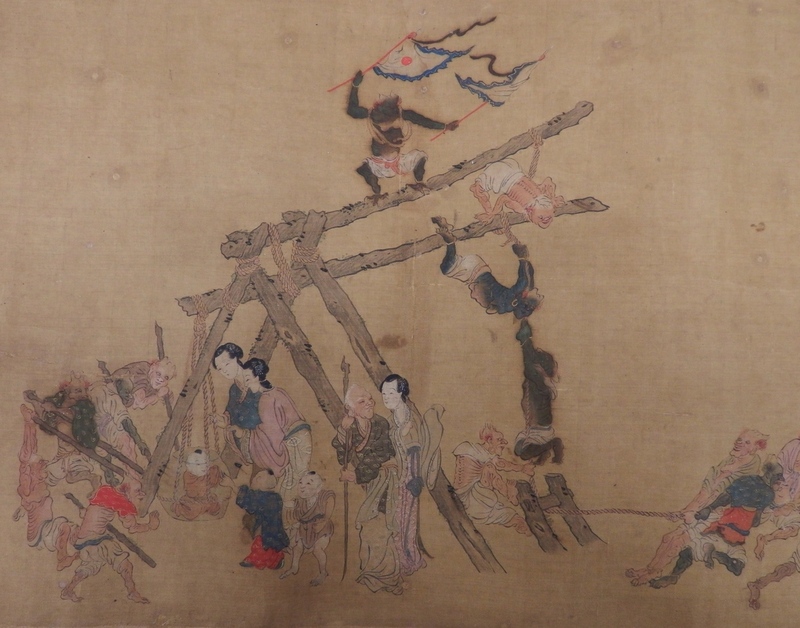 The scroll is comprised of three sections, beginning with a long strip of plain white paper speckled with a fiery red glitter; the demonic painting on fine quality silk; and a calligraphic postscript. This painting is a skilfully executed, mid-Qing Dynasty (1644-1912) copy of an earlier work in the style of Li Gonglin (pseudonym Longmian jushi, 1049-1106). The postscript reveals the moral tale that inspired the painting, and provides us with an accurate title for the work. 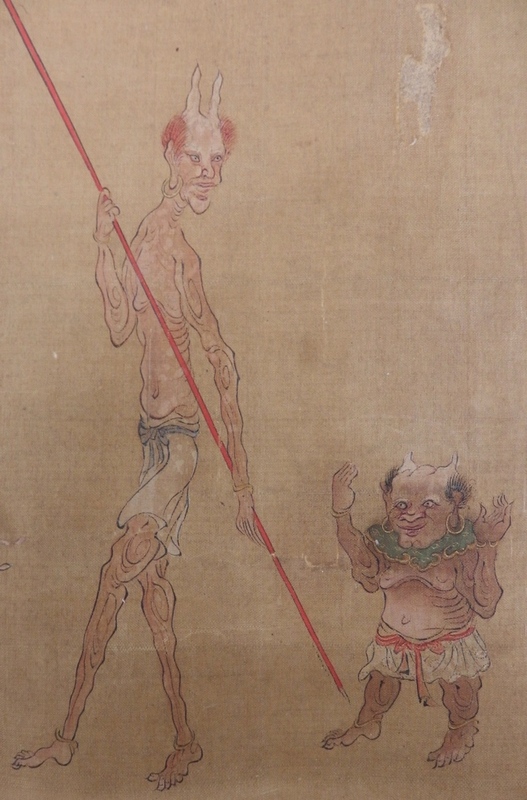 The painting is associated with The Sutra of the Demon-mother told by the Buddha (Foshuo Guizimu jing佛說鬼子母經) – the title of a third to fourth-century Chinese translation of a Sanskrit text that relates the conversion of the demon-mother (Guizimu 鬼子母) to Buddhism. The contents of the tale most closely resemble the 106th story in the Samyuktaratnapitaka-sutra (Zabaozang Jing), a fifth-century Chinese translation of an Avadana Tale of How Hariti Lost Her Child (Guizimu shizi yuan)1. Paintings with this theme have also been titled Raising the Alms-Bowl: The Conversion of Hariti2. Guizimu (Sanskrit: Hariti) is a flesh-eating demon that steals other women’s children and feeds upon them. In spite of her appetite for infants, Guizimu is also the mother of 10,000 children and the beautiful young women in the painting are actually Guizimu’s daughters. The other figures are Buddhist demons (rakshasa) and yaksa generals of the Heavenly King Vaisravana’s army. 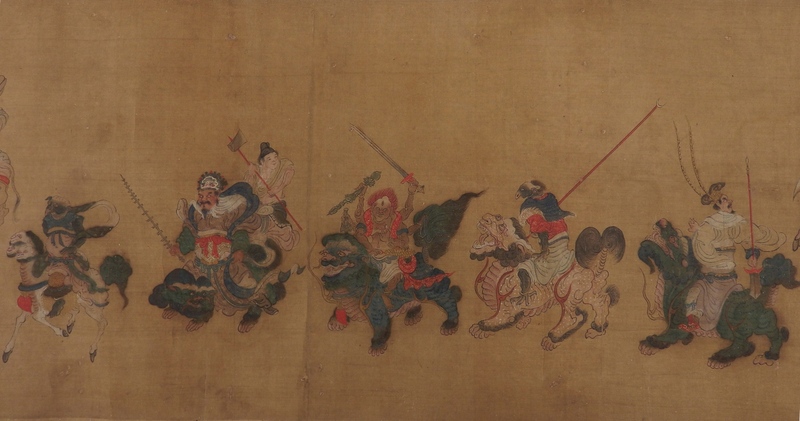 Among the yaksa is the father of Guizimu’s offspring, the commander-in-chief, Pancika (般闍迦). 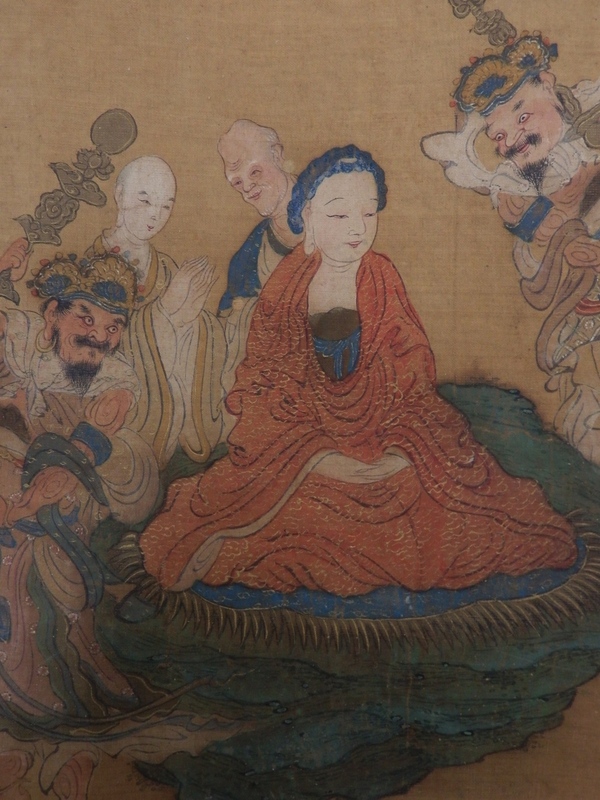 The scroll’s text relates how the suffering mothers of the murdered children begged Buddha Shakyamuni to protect them from the tyrannical monster Guizimu. 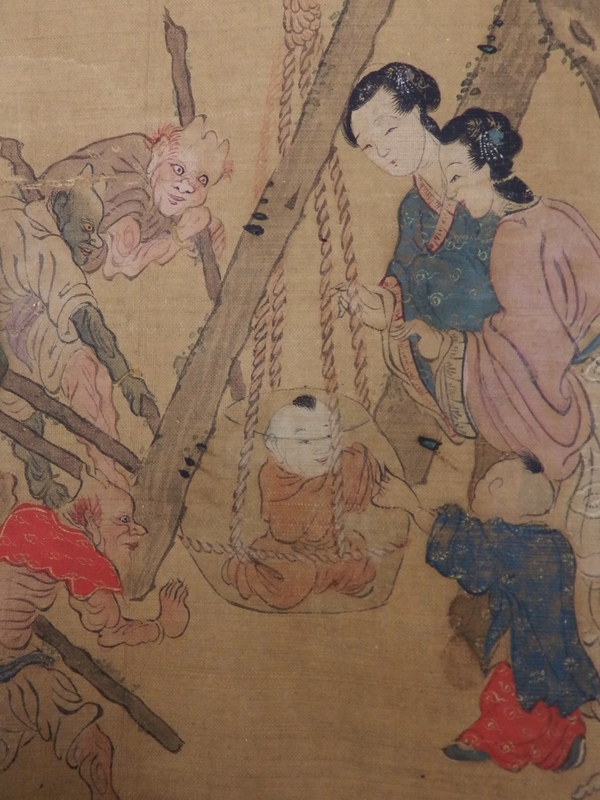 In response to their pleas, Buddha decided to teach Guizimu compassion by taking from her the youngest of her children, Priyankara (嬪伽羅), and hiding the small boy at the bottom of his alms-bowl. Guizimu searched everywhere for Priyankara for seven days and nights, but could not find her son. Frantic with worry, Guizimu asked Buddha for help. He replied: “You have 10,000 children and you have only lost one son. Why are you so upset?” Guizimu recognised that her misery at losing one child could not compare with the grief of the women whose children she had eaten. Buddha agreed to return Priyankara if Guizimu made a vow to stop killing children and convert to Buddhism. When Buddha revealed Priyankara to be hidden in the alms-bowl, Guizimu exhausted all of her supernatural strength trying to lift the bowl. The Guizimu or Hariti cult developed in Gandhara (North-West Pakistan and North-East Afghanistan) around the first to second century CE, and spread to China via the Silk Road along with the teachings of Buddhism. In Japan, Guizimu is known as Kishimojin, and is an aspect of the Bodhisattva Kannon, Goddess of Mercy. 1 Liang Liling, Zabaozang jing jiqi gushiyanjiu (A Study of Samyuktaratnapitaka-sutra and Its Story), (Taipei: Dharma Drum Publishing Corp., 1998); p.7 referenced by Hei Rui in Hariti: From a Demon Mother to a Protective Deity in Buddhism – A History of an Indian Pre-Buddhist Goddess in Chinese Buddhist Art, M.A. Thesis (University of Macau, 2010); pp.9-10. 2 A painting on the same theme can be found at the Metropolitan Museum of Art, New York.